. We abandoned the project for a better Idea. beautiful details! i'd love to see the better idea cuz this rocks real pretty. Jeez! - nice one man . Amazing. Way to charge into the New Year!! hahah they're really cute together. Happy new year!! i'm looking forward to seeing the better idea. So sad these two kids, Whatever happened to them btw?? You always put in such nice details everywhere, and it turned out to be so full of emotion with those expressions on their faces! This great! I love the look in the boy's eyes. I'll check it out when it airs. The animation looks great. Very nice! Great textures in the hair! The looks on their faces is wonderful! Happy New Year!! Very sweet characters! I love the colors and the dress of the girl. Very beautiful design and colors technique!! Wow, this is really fantastic. It's gotta be one of my favorites. All the little details are beautiful, like the lace trim on the little girl's dress and apron... Superb! Awesome!!! The shapes and details are blowing me away. Happy New Year, Shane! right click and save. So adorable! Happy New Year Shane! right on man. so beautiful. let me guess, under an hour? shane-ism art is running wild on the blogs. Agreed Ovi. I see it too. I also, cant deny being inspired by Shanes work! Lovely stuff, i like her dress´ detail. and the shiny ´-We´re about to cry for Mommy- eyes. You can do no wrong, man! Freakin awesome dude, and a Happy New Year to you!!! God bless you a lot in 2008! I and my friend talked about your drawing, he concluded that you are one of the best characters design of the last times. I have to agree with him! Soon he will make a blog! You need to see his drawings! His names is Alex! I love better ideas and awesome concept art for old ideas! Shane-isms and Prigmore-ness, it's all good! Happy New Year! Woah. These characters have some great details and shading/highlighting that give them a sense of realism and three dimensionality, while still being stylized and somewhat flat. You've created a delicate balance that's really nice! I bet they smell terrible. Yeah, I can totally see why you abandoned this idea. This is the worst piece of...I HATE YOU. Amazing! Your work is always very inspirational! hahahah oh man ... poor little guys ... still it´s hilarious!! i love little girl face ! so sweet ! Fan_tastic_. I love these characters and I really, really want them to eat a candy cottage. Wonderful characters!! I love the girl's face!! I really cannot spell... cool stuff man, I really like them. Awsome! Those are great man! So cute...you just wanna fatten'em up and eat em. Hot diggity! ~Pretty winsome kids, these two! Happy New Year. PS: I haven't used the word 'winsome' in a while. Or 'hot diggity' for that matter. Guess this piece brings out the quaint words~ in a good way. Hey Shane, happy new year for you too! I love the expression on this!! theay rea soo Cutes!!! wow this is all such beautifull work!! i love the little decorative elements! the textures are amazing too, how do you do it?? what programs are you using?? Well, I guess the new idea must be something very juicy then! Looking forward to see more and wish you the best fun for your new year artwork! This is really cute! I love the look on their faces and the design is awesome. happy new year shane, and wishing that you draw more n inspire us even more... thanx!! Shane mate, I need your contact info,for a big animated project can u reply to my blog? it makes me a hole! Great job with their emotion! I'm also a sucker for their costumes. Great work, Shane. 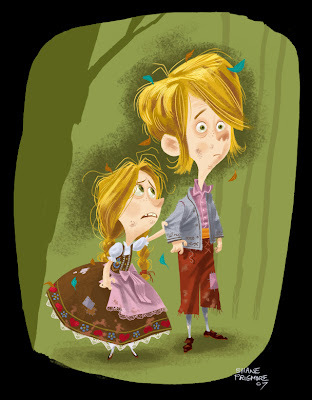 Looks like Hansel and Grettel. Beautiful designs Shane! Cannot wait to see the other idea you guys ended up going with! This is a great piece! I love it! this is so so beautiful! love your work. You're incredible. Seriously, you're my new favorite artist...instant fan. I love it! Real fun to look at- the mood is perfect, and i love the rough style. What program do you use? Candidates who appeared in TNPSC Group 4 result 2018 can obtain marks from Answer Key and they can derive the expected cutoff Marks and Score before vao exam result announcement. official answer key 2018 published in rejinpaul website will help applicants to estimate the result.Candidates must go through our website guidelines to clearly to know the information needed to download answer key and calculate the cutt off marks.